Good idea !! can you give us some more detail ?? Is your pond ornamental or for fish production ? How many concrete rings make up up your biological filter system ?? What size substrate are you using ? I think the coconut mats are an inspired idea especially as it will make cleaning the topmost layer of substrate (are you using sand by any chance ?) that much easier to clean !! With the added benefit of creating nutrient rich mulch mats , pure genius !! Although I'm a little way off yet (currently putting in the basic infrastructure on a 2 rai plot ) I've as always been doing my research, presently into slow sand and other biological filter systems (so expect some new links soon) , Ideally I would like to set up some sort of aquaponic system where the nutrient rich water from fish tanks/ponds provides nutrients for "hydroponically" grown vegetable crops whilst the plants act as a biological filter cleaning the fish tanks and maintaining a balanced ph. "Slowly, slowly catchee monkey !". Do you have any similar system set up for treating your "grey" water from the house ?? Any info rough sketches, photos etc. and further enlightenment most appreciated !! The pond is both ornamental and for fish production. We have pla nin and tub tim (as they look nice). I can only guess the size, it's about 12k liters, so not huge. We have 3 concrete rings filled with gravel, as the bio filter and the coco mats are on top to catch solids. 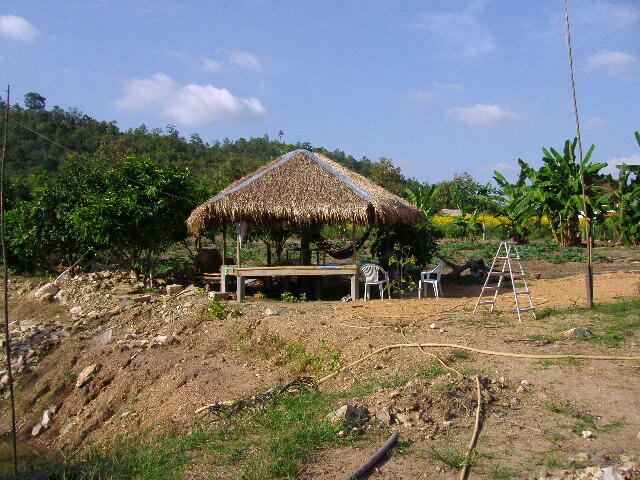 The pond is slightly higher than the surrounding area, which gentles slopes down, so an aquaponics system is possible. However as we are only there on weekends, it's not really feasible. Aquaponics is a great way to understand micro-organisms and the idea of 'closing the loop' for sustainability. However unless you're in a country with water shortages, I think it's hard to justify the cost and use of so much plastic, so I'm just using the water and mats on our garden. I plan to include some worms in bio filter, to eat the fish poo. The filter has a tap and either drains back into the pond (passing thru another set of mats/coco coir on the way) or is diverted to water the garden. There is an overflow pipe with a hose leading to the bottom of the pond. The idea is to add water from the well, when the overflow pipe starts to work it draws water and solids from the bottom. This will help clean the pond while adding fresh water and also saves on electricity, because only only one pump is used. I also believe the overflow system does a better job of cleaning than using a pump. The fish have been in for about 6 weeks now and are growing well, the water has turned a bit green, although apparently this is OK for tilapia. I haven't tested either the water from the pond or from the well. Although there hasn't been many deaths and the fish aren't at the surface gasping for air. ^ Good post. I gave up digging after seeing better results from areas where I'd just thrown down mulch and then kept piling leaves onto. Jandtaa, I think you'd be very interested in aquaponics, because it goes into the science of all the bacteria that converted fish poo to plant food. A Canadian researcher did comparative studies between hydro and aqua systems. The hydro system performed better for the first few months, but once established the aqua grew faster. Even when the hydro system copied the nutrient breakdown in the aqua system, it still didn't perform as well. It is not fully understood why, but it seems to be because of the bacteria. Yeah Smithson it does interest me !! Looked into hydro when I started my little lettuce growing operation at my folks place in the U.K. a while back but it was fairly costly and I had identified I could get a premium price if I grew them organically so didn't persue it any further. More recently someone from the site where I post my PDF's got in touch asking about growing organic greenhouse tomatoes as he has an aquaponic set up in california selling both fish (Tilapia if I remember correctly) and veggies.Looked like a slick operation I'll try and find the link. Started doing a bit of research into it as well as bio-ponics or organi-ponics but the aquaponics seem to be streets ahead, its not just at the research stage there are commercial set-ups. Started to ask a few questions in the hydro thread so see what that turns up. I can't see myself doing anything for a couple of years as I have so many projects to put into action (wormeries to build, carbonisation kilns to build and as the missus keeps reminding a new house to build on the home plot ) but its good to get the research done in the meantime. Because I've just dug a couple of ponds I want to find out how it might fit into the equation, would the Aquaponic tanks be suitable to raise fry before releasing them into the main ponds, recirculate water etc... I've got quite a lot of info on pond aquaculture now and will stock up later in the year. Yeah its the bacteria that do all the work you just have to study a rainforest ecosystem to see everything in nature in perfect balance without the intervention of man and his chemicals and harmful tillage methods (gonna post something about alternative ploughing methods sometime as it's probably important for farmers working on a much larger scale than me). I mean look at the size of the bloody trees !! Where's the nutrition coming from ?? yeah that's right the bacteria in the soil-web beneath the forest floor !! Also interested in vermi-ponics if thats the word to use you have both vermiculture and hydro systems I believe are you thinking of doing any experimenting ?? Any links you come across (do you have one for the Canadian study by any chance ?) would be most appreciated. ^ Just a few points from what I've read. The mollases is available in 4ltr containers, about 150B from memory. Regarding the aquaponics, vermiponics etc. Aquaponics seems to be better established, there are a few places operating commercially, however it's mostly hobby. The advantages of doing it in Thailand is cheap and available fish, lack of regulations and climate. On the down side, the set up costs aren't a bit expensive. For example, in Australia, large water tanks are cheap because the govt. wants everyone to save water. Also, it's easy to find old bath tubs, blue barrels etc - all of which need to be bought in LOS. The rainy season is also a challenge. AP is fairly tricky because a balance needs to be achieved and fish are more sensitive than plants. What I hope to do (eventually), is have nice set up with a pond and plants that's also an area to eat and relax. This will help justify the costs while also having the fish and vegies close to the cooking area. The ongoing drought in Aust. means no more vegie gardens, which is fueling interest in AP. The best place I've found for AP discussions is here Some really good discussions and interesting experiments going on. Regarding the sub-forum, I'm definetely adding my support. Never even crossed my mind there would be a forum dedicated to aquaponics !! OMG another forum to keep up with at least I will be mainly reading !! Yeah I was thinking of concrete tanks of some description maybe the drainage rings or cast some myself to keep the costs down (you may have noticed I like the DIY approach to most things saves a few quid and I'm not exactly rolling in it ) also one day if the smallholding becomes succesful in providing the family with all it's food and maybe a bit of spare cash I can get the local school involved using it as a study center to teach the kids,I reckon aquaponics could be a fascinating study aid but obviously they need to be able to afford the set-up themselves so I would aim for as low cost/tech as possible.Another project is to build a covered net-house/shadehouse of some description, I've been working on some plans and looking into steam bending bamboo to make the hoops for the frame (similar to a U.K. style polytunnel really but with much greater ventilation. This will give me some where to grow in the rainy season bit of protection for more delicate plants in the hot and if I make it big enough (looking at about 4 by 15 meters at the moment) somewhere to stick the aquaponics. Hi loong no acid soil (generally tropical clay soils are) has low ph and is raised with lime in its various forms (alkaline substances) and alkaline soil has a high ph and is lowered with sulphur or aluminium sulphate (acid substances). Although plants all have a preferred ph a good general guide is to achieve a ph of around 7 (neutral on the ph scale) where the acid and alkalines are balanced. I'll post more about testing and how much material to add in order to alter your soil ph later. How about some form of drainage into a buried tank (maybe sealed concrete rings ) you would then obviously need a small pump but their fairly cheap out here. - Go for a system that has pumps from the sump into the fish tank, which then overflows into the growbed. This means the fishtank level remains constant and the fish waste goes straight to the grow bed. It's easy to create a whirlpool effect so all the waste goes to the the center of the tank bottom and is sucked up by the over flow pipe. If you look on the forum you'll see it referred to as CHIFT PIST. - I would suggest using as few containers as possible IE, one for the fish, one for the sump and one for the growbed. This is much simpler to plump and ensures water gets to all plants evenly. Regarding the school project - definitely a good idea, this is also being done in Australia. AP is literally a closed loop system, so it's a great way to teach kids the concept of 'closing the loop' for sustainability. Besides the fish and plants, there's also the microorganisms and worms that somehow appear in grow beds. So ppl grow fish food in the system and have worm boxes for the vegie scraps, with the worms in turn being fed to the fish. A real mini-ecosystem. One of my great dream/crazy ideas, is to have an AP restaurant. 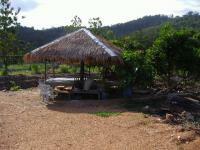 This would mean super fresh organic vegies and fish, in a pleasant atmosphere with a backdrop of running water. The concept of AP is so interesting that it may be enough to attract diners. hello all. 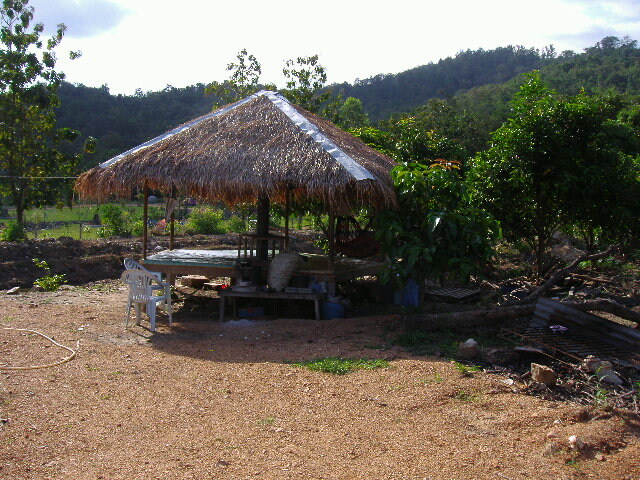 i currently am based in hawaii, and living with my new wife near kalasin (yes, i don't use capitols much). i'll be here for a few more days, then back to hawaii. i learned there is a commercial ap place there that is happy to give tours and answer questions. as i am intending to start with ap when i enter permanent residence in thailand starting around new years, i will try to get all the info i can. in the past i've been a dirt farmer (organic truck farm) and my hope is to have a modest sized system to learn from and then expand. my understanding is that the water from the fish becomes more acid, and in some systems, bases are added to neutralize. i wonder if since thailand has so much limestone, if using limestone gravel as a base wouldn't be useful. i'm also interested in using waste plastic scrap as a media. aparently it works well as a base for plants and bacteria, and cleans easily. incidently, my understanding is that tilapia are pretty tolerant of ph and temp changes, depending on the variety. cheers! I'm not sure how successful ap would be in the tropics, it seems to work best in warm dry areas, like parts of Australia. Any plastics used must be food grade, so set up can be very expensive. I gave it a try but didn't really have time, instead I just pumped the water from my pond onto my garden and topped up the pond from the well. This was quite successful, we'll do it on a more organized scale this year. thanks for reply. tilapia are ok up to 43c. 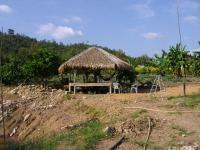 many vegetables grow very well in thailand, so i think if tanks are in the shade, they will be fine. as to food grade plastic, water for fish and humans is pumped thru both pvc and cpvc with no harm. other growers have used plastic machining waste and plastic scrubbers as media with success. plastic harbors bacteria growth, is easily steamcleaned, doesn't break down, so lasts for years with minimum maintenance. i read today that tilapia have no problems with water from above ph 5 to under ph 9. a friend in hawaii is tank raising tilapia and uses a 12v pump with a small solar panel, very slick. i like the idea of pumping pond water on the garden, however in my case i will be renting, so digging a pond is out of the question. I am currently loving learning all about this with a serious interest in setting up a system. Is there anyone who can give us a rough indication of set up costs? I am interested in aquaponics though a complete newbie at it. I have a sala which is not used and I am thinking of re-roofing and reflooring it and using it as a starter for aquaponics. I think I can use 6 storage boxes from Makro which are internally 70 x 50 x 44cm each filled with gravel or small stones to 30 cm making about 100 litres per box. I will interconnect them all for the water in from the fish tank and the same for drainage back into a fish tank at ground level with about 300 litres of water. A small submersible pump will pump up to the feedbed boxes and all the outputs of clean water will run back through a tap into the tank. According to Backyard aquaponics I should flush the whole system through every hour and preferably use an aerator as well. They recommend a maximum of 2kg of grown fish per 100 litres of feedbed. I was thinking of Pla Nin or Tilapia which is what the family like to eat at about 400 grams each. I am still in the planning stages and it will only be a hobby so far. I can grow different veggies in each box and only in small numbers to begin with. If it works then expansion is simple using the same methods and a different part of the sala. What I am really having a problem with is finding a plastic tank fish tank of about 500 to 750 litres and about 200 x 100 x 50 cm which would slide nicely under the sala. I live 75 km southwest of Khampaeng Phet but there is nothing local that I have found for the tank. The rest of the stuff is easy apart from perhaps a timer for the pump. I will try to draw up something this week and post it on the forum. Sounds like a bath tub might be the closest you will get, maybe two. Try HomeMart of the like. Another option might be to look at rotary moulded plastics like the plastic boats and canoes you see in most parts. Thanks IA for that info but I suspect that I am about 5 or 600 km from the nearest beach but there is a new mega homepro type of shop down in Nakhon Sawan that might have something. I vaguely remember the last time I had or used a bath would have been in the UK back in 2005, and no I am not a soap dodger. There are many plastic factories in Nakornsawan, you could get a very big tank in reasonable price.